By Laurel Lathrop / Jun 2013 / Comments Off on New Issue! 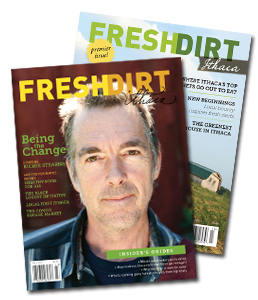 We are thrilled to announce that the Spring/Summer 2013 issue of Fresh Dirt is now on sale! This time around, article topics include: how to have difficult conversations (with input from experts like an advice columnist, a Tibetan monk, and a bartender); profiles of the people who are taking charge of school lunches; and a rundown of where local massage therapists go to get a rubdown. Plus recipes, a crossword, green news bites, and much much more! Buy Fresh Dirt today–now on shelves all over Ithaca, Trumansburg, and nearby, including Green Star (the big store), Red Feet, Petrune, Home Green Home, Buffalo Street Books, Mayer’s, Wegman’s, Barnes & Noble, the Trumansburg Gimme!, Good to Go, Sundrees, and the Brookton Market. By Friday we’ll also be in IthacaMade, Moosewood, and Neighborhood Pride. And you can always subscribe via our website! We’re proud of the content in this issue, but we know we couldn’t make this magazine without the support of our community and the incredible makers and thinkers who inhabit it. So thank you for being a part of Fresh Dirt!